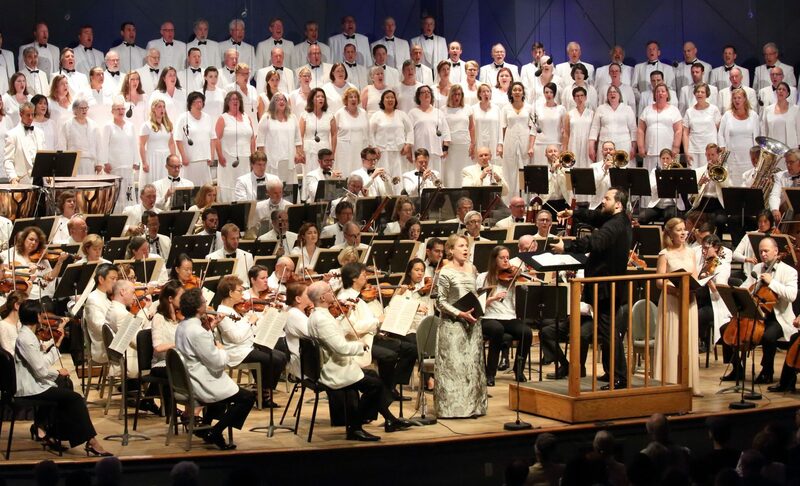 Tanglewood in July…Mahler and Wagner and Shakespeare, oh my! 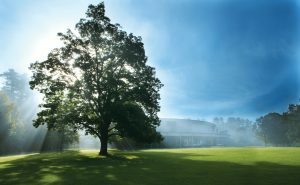 In July, I had the privilege of hearing two amazing concerts at Tanglewood, the summer home of the BSO (Boston Symphony Orchestra) My dear friend Joy McIntyre “summers” in the Berkshires and teaches every year at BUTI (Boston University Tanglewood Institute – a summer program for high school singers and instrumentalists). Joy graciously extends her hospitality to me every summer so we can attend concerts together, and this summer I traveled to the Berkshires two weekends in a row. 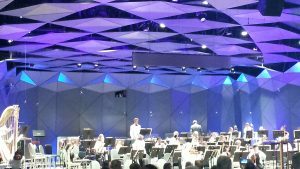 This particular Tanglewood season is filled with great artists, and to my own taste and preference, numerous concerts featuring singers. The two concerts I chose to attend featured works that I have performed professionally – Mahler’s Symphony No. 2 (“Resurrection”) and a concert performance of Wagner’s Das Rheingold, the first of the four Ring operas. In a “concert performance”, an opera is performed in full, but with no costumes, sets or props, and with limited staging…as much as the front section of the stage will allow with a full orchestra behind you. 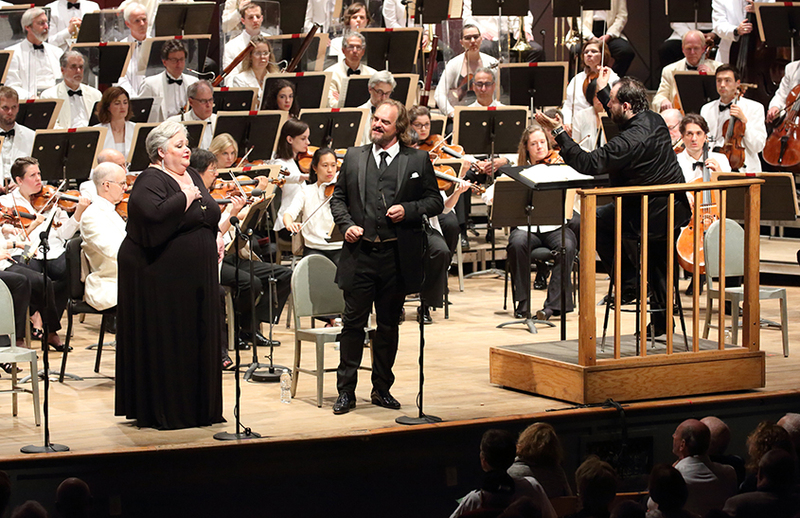 This is an effective and much less costly way to present an opera and this format is becoming more and more prevalent with orchestras these days…in fact, the NY Philharmonic also presented Das Rheingold just last May in NYC. Of course, the “supertitles” were very helpful (translations projected on a screen above the stage), even for those of us who know this opera well. The atmosphere in western Massachusetts is quite special…from Manchester, NH, you get yourself to the Mass Pike and drive almost to the very end. I get off at Lee and then drive about 20 min. to Joy’s sweet condo in Pittsfield. On the way, I pass by Lenox, which is the swanky town where the Tanglewood campus is located. 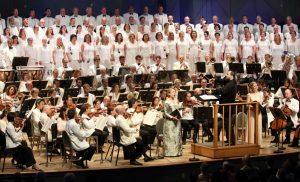 In addition to 50 or so BSO concerts, there are Boston Pops concerts, the annual appearance by James Taylor, and when large choral works are scheduled, the wonderful TFC (Tanglewood Festival Chorus), which performs everything from memory. This was the case with the Mahler symphony, which ends with about 15 min. of the most glorious orchestral and chorus passages ever written. Love my Mahler! This symphony, one of several Mahler orchestral works that features solo voices, has a beautiful movement for alto solo called “Urlicht” (heavenly light). This is a lovely 5 min. work that gives the soloist a chance to shine. One of my favorite singers, the superb mezzo-soprano Bernarda Fink, was the featured soloist in the Tanglewood performance. The soprano soloist has much less to sing, and that is mostly with the chorus. The soprano here was Malin Christensson. In May of 2004, I had the distinct privilege of performing this work with the NH Symphony Orchestra. There were 2 performances back to back (Friday and Saturday nights). The music director of the NHSO was Kenneth Kiesler. Sadly, the NHSO folded a couple of seasons later. Here is me singing the entire “Urlicht” movement. This is an experience I will never forget, and one of the highlights of my career. 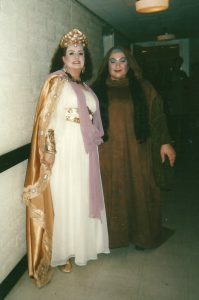 Earlier in my career, I performed the role of Fricka, “head goddess” and wife of Wotan, with Arizona Opera. The Arizona Opera Ring was very unusual in that it was the first time the complete Ring cycle was performed in the American Southwest. These days, opera lovers the world over are Wagner-crazy, and even smaller regional opera companies manage to perform a Ring in some form – the 16+ hours of all 4 operas condensed into 3, 4 or 8 hours; English language versions (ouch! ); and “greatest hits” versions, with just the main themes rather truncated. I have even found on YouTube a version without voices…orchestral music only. But this is not so unusual, since Wagner treated the human voice like any other instrument as a means of expressing emotion and further the drama, which was paramount to the composer. But back to Arizona Opera. This production, performed between 1993 and 1998 in part or as a whole, was conceived by Glynn Ross and Henry Holt, the team who first produced the legendary Seattle Ring in 1975. The cast was mostly American and quite fine if I say so myself. It was an immense thrill to be able to sing this glorious music with such wonderful colleagues as Edward Crafts (Wotan), Leslie Morgan (Sieglinde), Karen Bureau (Brnnnhilde), and my dear friend to this day, Cindy Sadler (the only artist who appeared in all four operas – a Valkyrie, Erda, and First Norn). Das Rheingold is actually considered a “prologue” to the other 3 operas (Die Walkure, Siegfried, and Gotterdammerung). Rheingold is the shortest of the 4 (about 2.5 hours) and is always performed without intermission. It also has the largest cast and is considered an ensemble opera. The principal characters are all introduced (Wotan, Fricka, Erda, Alberich, Mime, and Loge, among others), as is the overriding theme of the entire cycle, that being human greed and envy. Das Rheingold translates into The Gold of the Rhein, and the precious gold, eventually forged into a ring, grants the owner dominion over the world, at the expense of love. Many of the characters are forced to choose between the two and most of the time, greed and power prevail. Sound familiar? This performance, with the BSO’s music director, Andris Nelsons, conducting featured some fantastic international artists including Stephanie Blythe (a last minute sub for Fricka) and Morris Robinson as the giant Fasolt (there are 2 scary giants who also vie for love and/or money, and Fasolt loses his life to his brother Fafner who ends up with the gold, at least for the duration of this opera). I worked with Morris back in 2001 when I performed The Mother in Menotti’s Amahl and the Night Visitors with Granite State Opera. Morris sang the role of King Melchior. Morris possess a wonderfully rich, dark, fulsomely resonating voice (is fulsomely a word?). He has gone on to join the Met’s Lindenmann Young Artist Program, and has a very successful international singing career. I “knew him when” as a thrilling artist and gracious colleague! 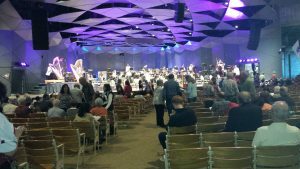 Below are photos of the Mahler and Wagner evenings, as well as perspective of the stage in the Shed, where both of these concerts were held. 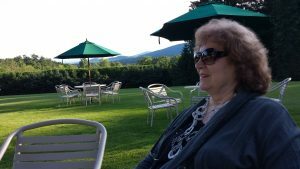 You will also see Joy in profile as we had drinks on the terrace of the Highwood Manor House, a beautiful old mansion on the Tanglewood campus that is now a very exclusive restaurant recently opened to the public for pre-concert dinners. On the Saturday after the Mahler, Joy and I attended Shakespeare and Company’s production of Cymbeline, one of the Bard’s lesser performed plays. The production was clever and very well acted. However, our seats were partial view, and Joy and I had for the most part had our fill of culture for the weekend, so we wearily departed at intermission. I was thrilled to be able to attend these two examples of “high art” and they were especially meaningful since I have performed them both professionally and therefore very, very familiar with all aspects of these works. I am grateful for that, as well as Joy’s largesse, friendship and hospitality. BSO Das Rheingold with Stephanie Blythe as Fricka and Thomas J. Mayer as Wotan. 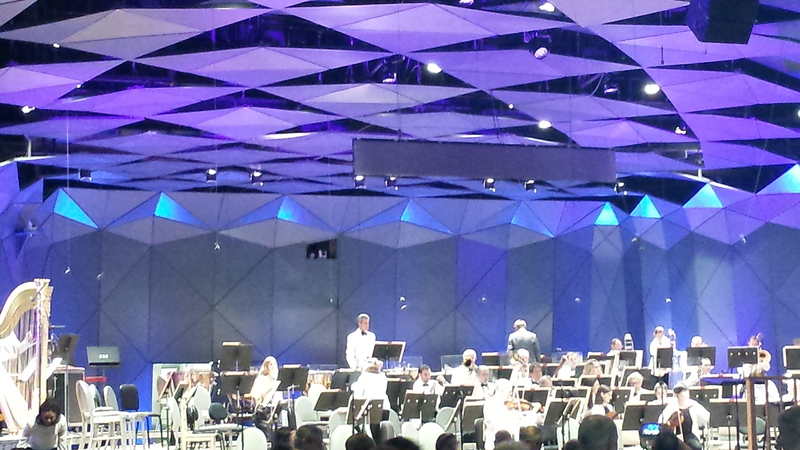 BSO Mahler Symphony No. 2. Bernarda Fink, alto soloist. View from my seat of the Shed stage (Mahler concert). 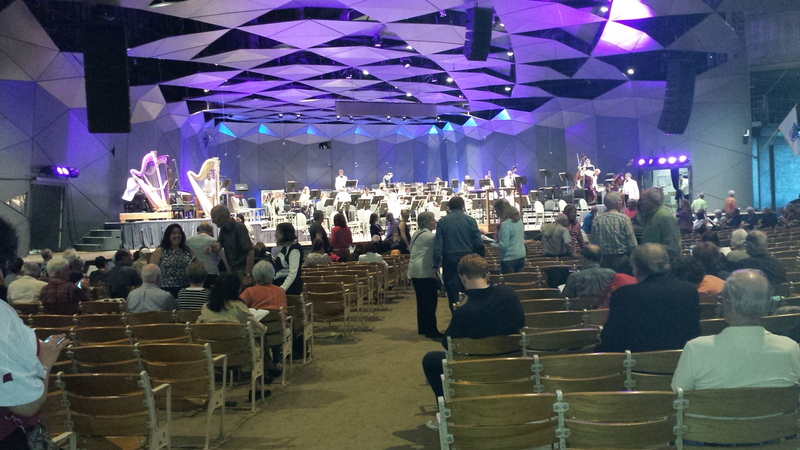 View of the Shed stage, Das Rheingold concert. Joy enjoying a drink on the terrace of Highwood Manor, prior to opening night.